On a DSLR camera, the primary purpose of a Clear, UV or Skylight filter is to protect the front lens element. You will seldom see a difference in your image quality caused by using a high quality protective filter, but whether or not to use a protection filter is the big running debate. Neither side is wrong in this debate, but they have differing opinions – and the freedom of choice. Want to skip straight to the recommended UV filters? Just click here. Let's take a look at the Should I use a protective filter? debate. The sans-filter users say that their lens hoods (you always use one, right?) provide all the protection they need. They say that *any* glass in front of their lens will degrade their pictures. And their contingency plan is that a damaged lens can be repaired under their insurance coverage (check with your insurance agent for your specific coverage details before relying on this). Of course, a required repair does not put the lens back into service immediately. An insurance claim puts a record with your name on it into the insurance company's shared claims database, potentially causing you to be considered a higher risk with higher premiums. And there is probably a deductible to be paid with this approach. I personally advise the use of a protective filter as the merits to doing so are many. In most instances, a high quality filter will not degrade the final picture. A very bright light in the background of your picture *may* cause the filter to generate a small amount of flare, but I seldom detect any other filter-caused image defects. If I scratch the filter, I can simply remove it and keep shooting. And yes, this has happened to me while using a $1,000+ lens. In addition, I feel much more comfortable cleaning dirt off of a filter than I do from a very expensive lens. I also feel a bit less protective of my filter-protected lenses (I might let a friend actually hold it!). A UV filter is not going to save the lens from a severe impact, so filter use does not negate the need for insurance coverage. Even non-regular filter users will want a filter when shooting in very dusty or harsh conditions (think salt water spray). And a very solid reason for everyone to use UV filter protection is that most weather sealed lenses require filters to complete their weather sealing. Peace of mind also has value. And if you are on the fence in this decision, peace of mind can easily push you over the use-a-protection-filter side of the fence. I need to say it: I do not consider a cheap, low quality UV, clear or skylight protection filter to be acceptable for most circumstances. Many of these exist – do NOT buy them. They will degrade the quality of your pictures with ghosting, flare and loss of contrast being the primary issues. Image sharpness can also be affected. Another risk is that the low quality filter will actually cause damage the lens. Some of Canon's lenses, including the EF 24-70mm f/2.8 II, 24mm f/2.8 IS, 28mm f/2.8 IS and 35mm f/2 IS, have a slightly curved front lens element. Some cheap filters do not provide enough clearance for these front lens elements and can cause scratches during installation. LensRentals.com replaces about a half-dozen front elements a week and a major cause for that damage is cheap filters not clearing the front lens element. Perhaps if I knew that I was going to ruin the filter for a low-importance shot, I might opt for a cheap/low quality model. But otherwise, I spent a lot of money for quality gear and I'm spending a lot of time photographing something that is important to me, so I'm not going to sacrifice my image quality by putting bad glass in front of my lens. Why pay a premium price for a lens only to degrade its image quality with a $25 filter? Get a quality filter or do not use one. When should you or should you not use protection filters? At your choice, high quality clear, UV or skylight filters can remain on your lens at all times. You will not see a difference in image quality in most circumstances. But, there are some situations that I have stronger advice for. If shooting in harsh elements (such as in salt water spray or in very dusty conditions), I highly recommend using a protection filter. If shooting with very strong backlighting (such as the sun), I am less-likely to recommend using a protection filter because increased flare is a possibility. The increased potential for flare is indeed the biggest downside to using a clear or UV filter. I hesitate to recommend the use of protective filters on very inexpensive lenses such as one of the 18-55mm kit lenses as the filter-to-lens cost ratio becomes harder to justify on such a lens. What is the best UV or clear protection filter? The most important part of any filter is of course the glass. Manufactured from Water-White Schott Glass, B+W's filter clarity is excellent. I have talked about clear, UV (also referred to as Haze) and skylight filters in this review. This variant is of course determined by the filter's glass. For digital cameras, it really does not matter which filter type you choose. My suggestion is to let price be your guide. UV filters have long been the favorite. In the film days, they were used to prevent UV light from reaching UV-sensitive color film (though have basically no effect with our digital sensors). As I write this, UV filters are modestly less expensive than clear filters so I suggest going with the UV variant. Again, since they will not effect your image or block a noticeable amount of visible light, these filters can remain on the lens at all times. Also very important is the filter ring. B+W's high quality matte black (to prevent reflections) anodized brass rings reduce binding/cross threading to ensure optimal alignment. You know you have a quality product in hand when you pick up a B+W brass-ringed filter - you can feel the difference. 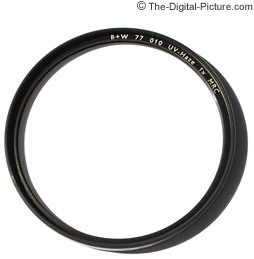 B+W filter rings come in various thicknesses. The standard thickness ring is by far the most-commonly chosen, but a slim ring is available for reduced vignetting on ultra wide angle lenses. For most wide angle lenses (in general, wider than 40mm), with and without standard UV filter test results are available in the vignetting tool (look for the second-to-last focal length option). This tool allows comparison to determine if the standard filter depth causes light to be blocked from reaching the corners of the imaging sensor. Cutting to the chase, standard thickness filter rings add very little or no vignetting to most lenses. If using a full frame lens on an APS-C format body, the standard filter ring will very likely work fine for you. The downsides to slim filters may be enough to make you prefer to deal with slight additional vignetting. The first downside is the extra cost. The second and perhaps most unpleasant downside is the missing front filter threads on the ring. Standard thickness filters have front threads that allow another filter to be stacked (I seldom recommend doing so) and allow the standard lens cap to attach to the filter. Slim filters ship with an alternative slip-on friction-fit lens cap that, in my experience, is only one step above worthless. I find them in the bottom of my camera cases more than on my lenses. Relatively new to the market, Breakthrough Photography's UV filters feature a thin (3.1mm) brass ring that practically eliminates filter-caused vignetting. The filters' frames are specifically designed for increased traction, greatly easing mounting and removal, even under challenging conditions (including with gloves). Breakthrough uses SCHOTT Ultrawhite B270 optical glass and a 16-layer multi-resistant coating to ensure its UV filters do not negatively impact image quality. Breakthrough’s X4 UV filters are well-designed, optically excellent and have proven rugged and reliable for me, making their recommendation an easy one. Usually, stacking filters over a protection filter is not a good idea. While you may not notice any image degradation with a single high quality filter attached, those odds decrease with additional glass placed in the optical path. Flare is again the primary concern. Take your UV filter off before attaching a circular polarizing filter or neutral density filter to your lens. The alternate filter will provide the needed protection for your lens. The only time I can remember stacking a filter over a UV filter was when I was shooting in heavy salt water spray. I wanted to be able to remove a polarizer without the salt water reaching my front lens element. Why does it matter where you buy filters? The biggest reason can be summed up with one word: Counterfeit. With filters being rather easy to counterfeit, I suggest purchasing them only from a reputable retailer to insure that you are getting the filter you expect. Those retailers I list below are my top recommendations (and my own choice), though care must be taken if using a 3rd party reseller on Amazon. I suggest using a protection filter in most cases. Buy a quality UV, clear or skylight filter and leave it on your lens. B+W makes excellent filters and I am comfortable recommending them to you. Put one on your lens and enjoy the peace of mind it brings. I'll leave you with one last tip – Be sure to know how to remove a stuck lens filter. Relatively new to the market, Breakthrough Photography's X4 UV filters feature a thin (3.1mm) brass ring that practically eliminates filter-caused vignetting. The filters' frames are specifically designed for increased traction, greatly easing mounting and removal, even under challenging conditions (including with gloves). Breakthrough uses SCHOTT Ultrawhite B270 optical glass and a 16-layer multi-resistant coating to ensure its X4 UV filters do not negatively impact image quality. Breakthrough’s X4 UV filters are well-designed, optically excellent and have proven rugged and reliable for me, making their recommendation an easy one.